So, anybody expecting to get IE8 before the end of the year- or even very early next year- can put those dreams (or dreads, as the case may be) on hold for a while. This week's announcement is a little surprising since I think many industry watchers (self included) thought Microsoft would ship the final IE8 version before the end of the year to try to keep pace with Mozilla and Firefox. But as Eric Lawrence (also from MS) said in the comments: "The IE team's goal is to deliver a quality IE8 as soon as possible. Providing exact dates is always problematic; no one wants to ship with nasty bugs just to meet a self-imposed deadline. Keep in mind that we support IE for up to 10 years after its release, and sometimes those extra few weeks save ~everyone~ a lot of pain later." Let's hope that statement is true and the version of IE8 that ships next year is as "painless" as possible. For Telerik's part, we will obviously provide full support for IE8 as soon as it ships, and even today you'll find near complete support for the beta versions of the browser. I think I'm going to start a new series on Telerik Watch to highlight my favorite (usually free) ROUs, or Random Online Utilities. You know the ones. The little online utilities that only do one thing but do it so well that you can't imagine working without them. Take for example the utility that someone in Telerik pointed me to today called "WhatTheFont." As the name implies, you simply upload an image that contains the font you're trying to decipher, help the online tool recognize your letters, and then it's off to the races providing you with likely font matches. And it works! 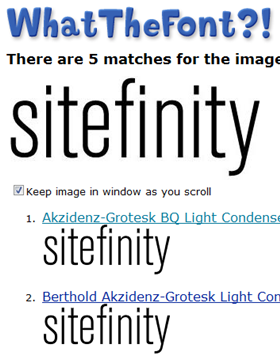 I used it today to figure out the font used in Telerik's Sitefinity logo. Now, this probably isn't a tool I'll use often, but it's definitely cool to know there is a tool out there that can help solve the infamous "what font are they using" question when the time comes. Hopefully this will come in handy next time you face a similar dilemma. Stay tuned for more "Radom Online Utilties" over the next few weeks and months. In the mean time, what little ROUs do you find essential (or just plain cool)? Multi-day appointments in RadScheduler month view now render as a single elements (vs. single elements per day). Month view also now supports a new rendering mode to "auto expand" to content size (vs. being a fixed height). 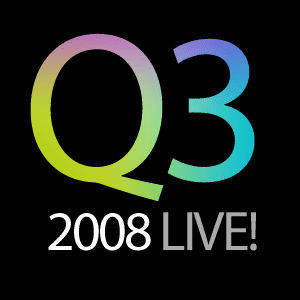 You can find the full release notes for the Q3 2008 SP1 release on the new Telerik.com and then download the new bits right away. 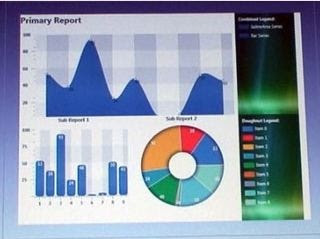 Enjoy the fixes, the new helpful features, and stay tuned for the Q1 2009 Road Map coming very soon. As everyone knows, several months ago I sought-out some of the brightest minds and best communicators to join the Telerik Evangelism ranks. Among the guys that joined our team is Gabe Sumner, the Telerik Developer Evangelist focused on our Sitefinity CMS product. Today Gabe launched a brand new blog dedicated to keeping you up-to-speed on all Sitefinity related news called Sitefinity Watch (you can guess where the naming inspiration derived). On this new blog (which runs on Sitefinity, of course), Gabe will bring you all the news you need to know to be fully informed about Sitefinity and the .NET CMS environment in general. He'll update often and the content is must read for anyone working with .NET CMS tools, especially Sitefinity. While in Las Vegas last week for DevConnections, I had time to create one more video with the Telerik crew visiting from our Bulgarian HQ. This time I chatted with Stoyan (a.k.a. Lini) Stratev from the Telerik ASP.NET Team about the new RadFileExplorer control added to the RadControls for ASP.NET AJAX in Q3 2008. Now, I wouldn't blame you if you didn't notice this new control in the release. It was added very late to the Q3 builds, and it's really more of a Rad "composite control" (in other words, it's made from a few existing RadControls) than a new "fresh brewed" control. As such, it's demos are tucked away in the RadEditor online demos and they may have escaped your attention during our release week. Nonetheless, this is a very usefull control for scenarios when you need to enable an online file browser experience, and Lini and I give you a complete introduction in this video. I hope you enjoy the new control and the quick video introduction! In this special edition of Telerik Watch Minute shot last week at DevConnections, I took a minute to talk with Miroslav Paskov from the Telerik Silverlight Team. Miroslav is one of the developers responsible for creating the new RadDragAndDropManager found in the RadControls for Silverlight, so I thought it would be cool if he could quickly tell us a little about how the new Manager should be used. And he did just that. The interview is about 7 minutes long and in it we see how the RadDragAndDropManager works, what code is required to add drag/drop to any Silverlight item, and how to handle drag/drop events. If you're curious to know more about this control and want to know how to get started with drag-and-drop in your Silverlight applications, check out the video! While at PDC last week, Vladimir Milev and I had the chance to spend about five minutes with Adam Kinney from Microsoft to show-off Telerik's new 2D and 3D charting engine for WPF. Adam caught the entire exchange on video and that video is now live for your viewing pleasure on Channel 9. If you haven't been paying attention, as part of Telerik's Q3 release, Telerik shipped a brand new charting engine for WPF that enables you to do some pretty cool data visualizations. You can animate your chart loading, build 3D charts (even using your own 3D models), and, of course, render all of the different chart types you typically need in an LOB app. We also shipped new XAML-based RadGauges for WPF and Silverlight that enable you to easily add gauge visualizations to your projects. 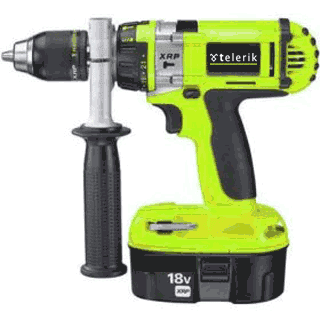 You can download all of this stuff now by visiting the new Telerik.com. A video is worth 10,000 words, though, so check out the video on Channel 9 or catch an embedded version after the break! In this third and final (for PDC) interview with Jan Blessenohl (OpenAcess ORM Team Lead), I ask Jan to show us how we can optimize the SQL queries OpenAcess produces. One feature that many ORMs provide, including OpenAcess, is Lazy Loading- or the concept of only loading objects when you need them in code. This is great for many scenarios as it saves you from loading more data than you need, but there are scenarios when you want to tell your ORM to load more agressively (for instance, when displaying data in a grid). In this video, Jan demonstrates how to create OpenAcess ORM Fetch Plans that enable us to easily optimize the SQL queries OpenAcess generates without requiring us to change the actual code of our query or object at all! So if you already understand the basics of forward mapping and reverse engineering, this video will help you go to the next step of optimization. UPDATE: How could I forget?! New support for ASP.NET MVC in the RadControls for ASP.NET AJAX! As you may have noticed by now, I've been a little quiet on the blogs this week. The reason: this is an extremely busy week. Not only are we still wrapping-up our content from PDC and preparing content for DevConnections, we're also making some HUGE public launches. First-up among those launches, after years of planning and preparation, the new Telerik.com is now live! And while that might be a big enough announcement in itself, it gets bigger. The new Telerik.com is running entirely on Telerik's own Sitefinity CMS 3.5 SP1! First things first, though. The new Telerik.com has been completely redesigned with the goal of making it as easy as possible to find content on the site and (for active developers) easy to use all of our support resources. The new website has been in some form of planning for well over a year and we appreciate everyone's patience as we limped along on the "old site" for longer than planned. I think you'll really enjoy the new site's layout and features, especially the heavily updated Client.net account page and simplified forums! One of the coolest things about the new site, though, is that it is a huge case study for Sitefinity. 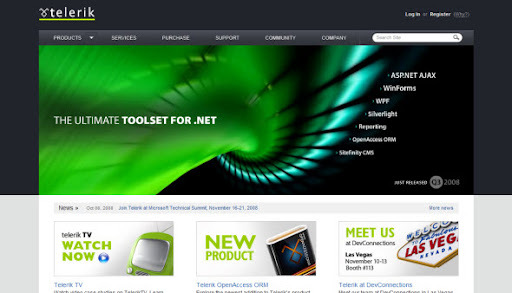 Telerik.com is obviously a very high-traffic site with hundreds of thousands of visitors from all around the globe. Running Telerik.com on Sitefinity has helped us not only prove the capability of the Sitefinity platform, but it has also forced us to build-in the "real world" performance improvements the plaform needed to host huge sites. It's EYODF at it's best. The end result is a great looking (and easy to manage) Telerik.com and tons of performance imrpovements in Sitefinity 3.5 SP1. As with any new site, though, our work is not done. We're working quickly to optimize performance on production servers and squash any reported bugs. We also have some more new "sub sites" to role out soon for blogs and videos, so stay tuned for even more updates. Until then, enjoy the new site and let us know what you think!